Excitons, bound pairs of electrons and holes, are the semiconductor equivalent of positronium and can be excited into Rydberg states like most hydrogen-like systems if the semiconductor crystal is of high quality. 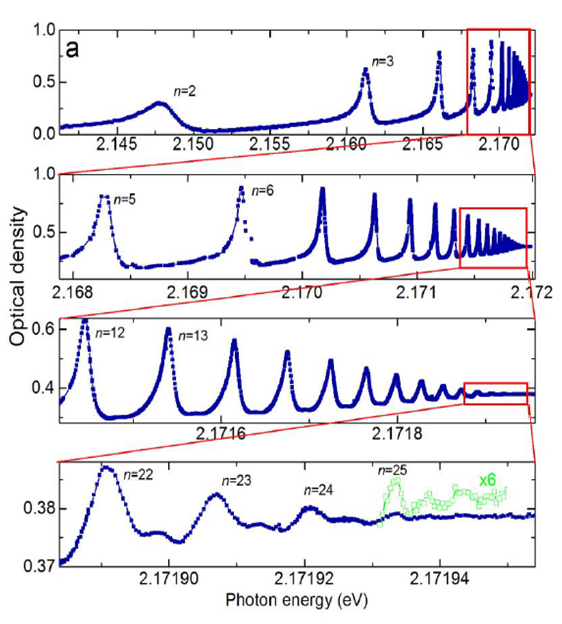 In the model semiconductor system Cu2O, states with principal quantum number up to n=25 can be reached in experiments and the exciton Rydberg energy amounts to about 90 meV. Compared to cold atoms, this energy is small and provides the opportunity to address all states from the first excited state of the system up to the ionization threshold using a single tunable laser, which opens up the path towards the systematic investigation of scaling laws of the properties of Rydberg systems with respect to the principal quantum number. Also other characteristic properties of Rydberg systems like Rydberg blockade can be reproduced in the exciton system. The main objective of this project lies in a systematic and detailed investigation of the dipole-dipole interaction of Rydberg excitons, while making use of the specific advantages of a semiconductor setting. Based on that, the possibility to induce Rabi oscillations between the ground state of the crystal and Rydberg exciton states will be investigated. Special emphasis will be placed on two-color experiments, which allow one to investigate the interaction between Rydberg excitons with different principal quantum number. The results of those experiments will form the basis for identifying the most reasonable way to implement quantum technologies using Rydberg excitons. The two main topics that shall be investigated within the project are the interactions of Rydberg excitons with different principal quantum number and the effects of the light-matter coupling strength in the Rydberg blockade regime.